By being Dreamlands itself it helps to meet its own condition. There are uses for readying all dreamers for sure - unending festivities being 1 card to really make it work, 70 steps another. This is it, this is what dreamer decks are all about. 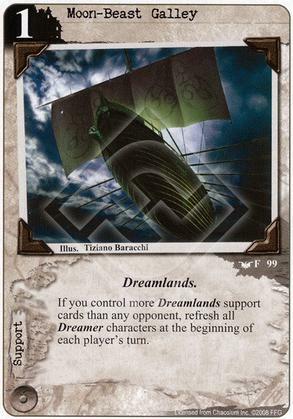 Seriously, there is very little synergy to the dreamer subtype and this card and dreamlands scholar are the only reasons to run lots of dreamers. If you are running a lot of dreamers, probably in cthulhu, this is a one sided mass stand. Which can be really good.